Biography: Itzchak Tarkay was born in 1935 in Subotica on the Yugoslav Hungarian border. When he was only nine years old, the Nazis sent Tarkay to Mathausen concentration camp. After the war, he returned home and developed an interest in art. While still at school in Subotica, he won a prize for excellence in painting. In 1951, Tarkay received a scholarship to the Bezalel Art Academy in Jerusalem, where he studied for a year before having to leave due to difficult financial circumstances at home. In order to continue his scholarship, he was allowed to study under the artist Schwartzman until his mobilization to the Israeli army. After returning to the familiar environment of Tel Aviv, Tarkay enrolled in the Avni Institute of Art, which he graduated in 1956. His teachers there were Mokady, Janko, Schtreichman and Sematsky. Tarkay has since exhibited extensively both in Israel and abroad, and his works can be found in many public and private collections. 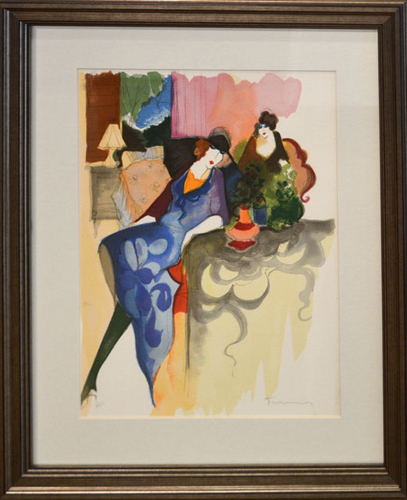 Tarkay’s originals have sold for more than $120,000.00.